A small lighting startup gets a guy used to big companies. Eric Kim, a marketing executive who has held high-profile gigs at Samsung and Intel, will become the CEO of Soraa, a cutting-edge lighting company focused on green lasers and LEDs. It's a somewhat unusual pairing. Soraa, founded by UCSB professors and highly regarded lighting experts Shuji Nakamura (a Greentech Hall of Fame member) and Stephen Den Baars, is actually two companies in one. Originally, Soraa focused on lasers, while Kaai, another company, focused on lights. The two recently merged. The combined company will produce green lasers for projectors and LED light bulbs that use 75 percent less energy than conventional bulbs. Soraa's LEDs will be made from gallium nitride, a company official recently told me. Conventional LEDs rely on sapphire, the official added. The bulbs will contain a single LED, but with multicolored phosphors. I've been following Soraa and Kaai since they were just a jumble of vowels on a PowerPoint, so I hope to bring you all more soon. Soraa will also build a fab in the Bay Area for making laser and LED chips, similar to what Bridgelux is doing -- another sign that manufacturing may return to California. We actually ran into Kim at a big Khosla Ventures event recently (Khosla Ventures is an investor in both Kaai and Soraa). He wasn't wearing a Soraa nametag at the time. Kim rocketed to fame in the IT world when Samsung appointed him to reinvigorate marketing in 1999. At the time, Samsung was mostly a second-tier brand known for cheap electronics. An early presentation on global branding by Kim was met with silence by execs, a Samsung source told me back in 2004, because the presentation focused on industrial design, advertising and branding. Then-CEO Jong Yong Yun said: "I know what you are thinking, but touch him, and you're dead." History wrote the rest. Samsung TVs became chic and the South Korean company arguably overtook the kingmaker spot in consumer electronics that was formerly owned by Sony. Soon after, Kim went to Intel to shake up marketing. It was an unusual move. Intel almost exclusively gives its top spots to executives who've worked at Intel for years. The tenure had its ups and downs. Remember ViiV? Or Intel's push to make chips for high-definition TVs? Or the push into consumer electronics? The Pentium brand, perhaps the biggest brand ever for Intel, was pushed to the wayside under Kim. The corporate logo was changed, as well. Since then, processors, chip speeds and processor brands have become less of a focus for consumers. You can't, of course, put all of this on Kim. Because processor speeds were outstripping the ability of consumers to exploit them, processors were bound to become less important. Centrino, conceived before Kim came to the company, has meanwhile grown in importance. 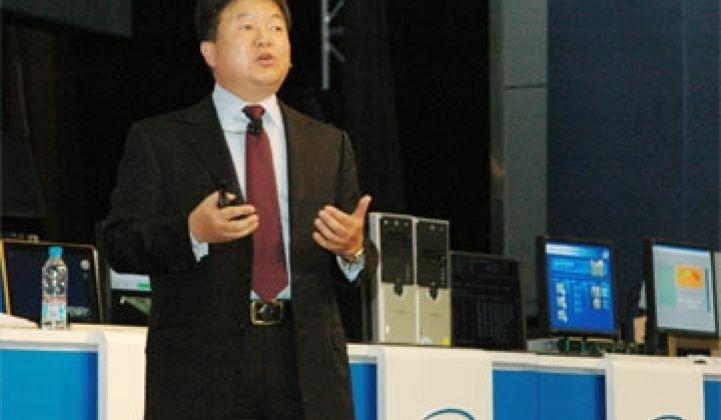 Still, the magic Kim brought to Samsung, it is safe to say, did not repeat itself at Intel. Tears will not be shed at the going-away party. How much can tiny Soraa benefit from a marketing executive? It will be interesting to watch. Soraa has been a lab and science company to date. Many of the firm's customers will be other electronics companies that are less concerned about the brands of their components and more concerned about price and performance. Then again, one of Soraa's specialities is green lasers, a novel component the industry has sought for years. A marketing exec could help bring that message out.